Confession #1: I tried BBQ ranch for the first time last month. The combo just sounded gross to me; why would you ever put barbecue sauce on a salad? I tried a bite of my cousin’s salad while we were out and loved it (thanks Brandy!). The sweet smokey with all that cool goodness of vegetables paired much better than I expected. How have I been living without this for so long? Confession #2: I have never served a salad as a main dish to my family for dinner before this very recipe graced our table. My kids don’t eat lettuce super well, Thomas is a man (sure some men eat salad for dinner, others do not…), and my momma never served main dish salads to my family growing up. They are a bit foreign to me I guess. 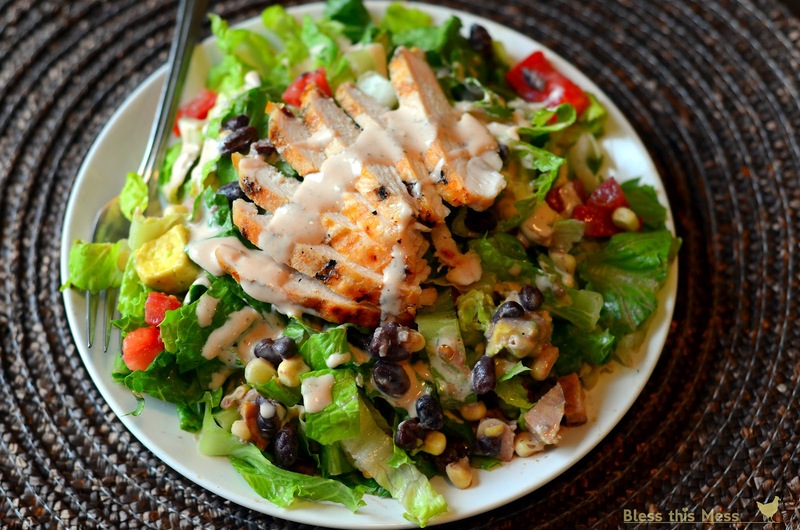 As healthy as we eat, salad as a main dish just didn’t sound like it would fly at my house. This recipe is wonderful. My kids ate it so well which I attribute to the divine dressing, and no one complained about it as a main dish because the beans, corn, and chicken really make it a satisfying salad. I hope you try it because it is delicious! For the dressing, simply add all of the ingredients to a medium bowl and whisk until smooth. For the salad just add all of the veggies and beans to a large bowl and toss to combine. Add the chicken on top. Lightly dress and toss right before serving. Serve with additional dressing and barbecue sauce to fit individual tastes. To quickly thaw frozen corn just rinse it in a sieve under warm water until it is thawed, about 30 seconds. I used original-style Sweet Baby Ray’s BBQ Sauce and loved the level of sweet it had. Plus, it was on sale. The leftover dressing is amazing as fry sauce and on about anything else you can think to put it on. I want to eat this right now! I hear you about salad as a main dish. I have only tried it a few times and every time I think Richard just chokes it down and then heads to McDondald’s while I sleep. I normally plan on dessert when it is a veggie heavy meal… no one minds either. This looks amazing… I LOVE salads as the main dish (I do have to do a good hearty bread as a side or the kids don’t do so well… :P) and this just looks too yummy. I’ll have to break it out soon! It’s on the menu at our house tonight 🙂 With no stove or oven to cook with, this will be perfect! This looks GREAT, I’m totally going to try it. And may I just say – WORLD CLASS food photos, girl! Excellent work! Beautiful photos Melissa! Your blog is awesome! I love the way you’ve designed it! Now you just have to tell me all your Foodgawker secrets, they still hate me 🙂 Suggestions welcome! Hi Melissa! Thanks for linking up on my FB page! this looks delicious and I have pinned it for future reference! yum! in a pinch do you think mixing ranch dressing & bbq sauce would work? Holy smokes! This looks amazing! Salad bar is one of my favorite dinners (my kids probably wouldn’t agree…) and so I was so excited to try this, it was amazing! I loved it! It was so satisfying and Max said it was his favorite salad ever! Thanks! I made this tonight for my family and they LOVED it!! Thank you! Wooohooo! Thanks for the feedback Tiffany! Do you suppose using greek yogurt in place of the mayo and sour cream would work fine? I’ve convinced my crew plain greek yogurt tastes as good as sour cream on tacos and baked potatoes. I have done it before with plain greek yogurt. Not quiet as good but still tasty. I’d make the switch if it meant trying the rest of the salad or not! 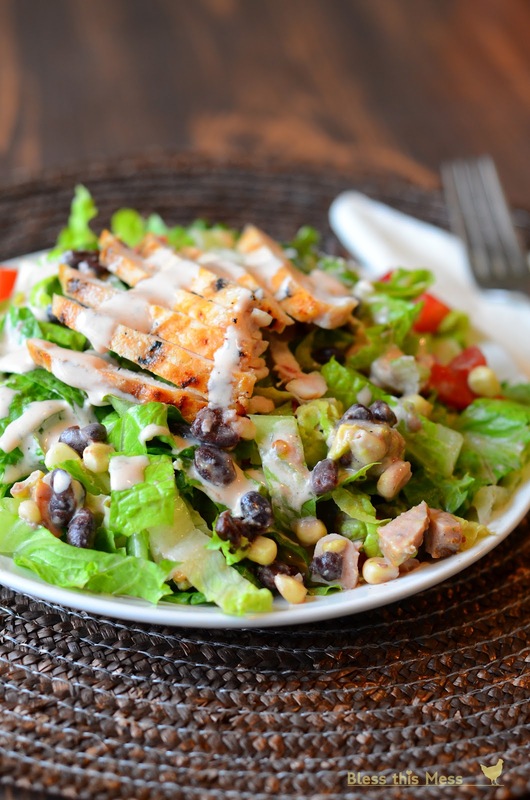 The first time I ate this salad was at Red Robin restaurant, about 15 years ago…I loved it and ordered it every time we went…they discontinued it after a while. I found the recipe online a few months ago. It is perfect for dinner in the hot desert. We eat cold salads a lot here in AZ…you do your hot cooking during the cool mornings…that way you don’t have a hot kitchen in the evenings. This recipe will go into my Mastercook. Thank You…sometimes I serve it with a cheese bread or Texas Toast. Thank you so much for sharing all your wonderful recipes. Planning dinner every night is such a chore for me, and I have vowed to do a better job for my family. Your recipes are helping me do just that. The fact that these recipes are “clean eating” recipes makes me feel even better! Thank you again for your kindness and generosity! Hurray for nice comments. You totally made my day. This looks incredible! 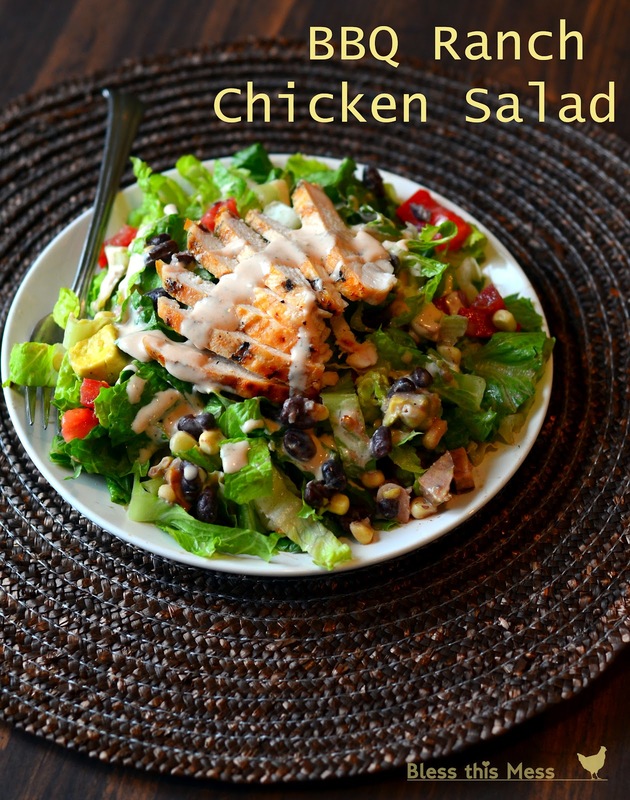 I am grilling your honey lime chicken tonight, and planning on this salad tomorrow. I never have buttermilk on hand, however. What would be a good substitute?